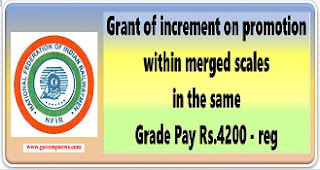 Sub : Grant of increment on promotion within merged scales in the same Grade Pay Rs.4200 – reg. Ref: FA & CAO/T/SC Railway’s letter No. ACP/KOO/Pt. VI (Restructuring) dated 06/01/2017 & 21/03/2017 and letter No. ACP/AO2/Pt. VI dated 01/08/2017 to Railway Board. Federation invites attention of the Railway Board to the letters of FA & CAO/T/SC cited under reference, seeking clarification as to whether the staff promoted from same Grade Pay to same Grade Pay (Rs.GP 4200) i.e. from the post of Senior Cashier (GP 4200) to the post of Inspector of Cashier (10C/GP 4200) are entitled to draw an additional increment as they are shouldering responsibilities. In this connection, Federation desires to state that the references sent by the South Central Railway have been pending in Board’s Office since Jan 2017, even though the employees are eligible for additional increment on promotion to identical Grade Pay, shouldering higher responsibilities in terms of Rule S-13. NFIR, therefore, requests the Railway Board to issue classificatory instructions allowing benefit under S13 to GM, S.C. Railway, endorsing copy to other Zonal Railways as well to the Federation. NFIR National Federation of Indian Railwaymen (N.F.I.R) writes to the Secretary (E) Railway Board, New Delhi seeking clarification as to whether the staff promoted from same Grade Pay to same Grade Pay (Rs.GP 4200) are entitled to draw an additional increment as they are shouldering responsibilities.